My mum is one of the greatest people to have ever existed – no sorry, she is THE greatest person in my life. She has been my best friend since I was little and even when I gave her grief during my teenage years; she still continued to love me unconditionally. One of the best qualities about my mother is that she has always given generously and puts herself last. Only now that I am older can I truly appreciate everything she has done for me and start to pay her back – even though it is going to take me an eternity to do so! So for her birthday, especially my last birthday in the house with her, I decided to do a little bit extra and really spoil her. 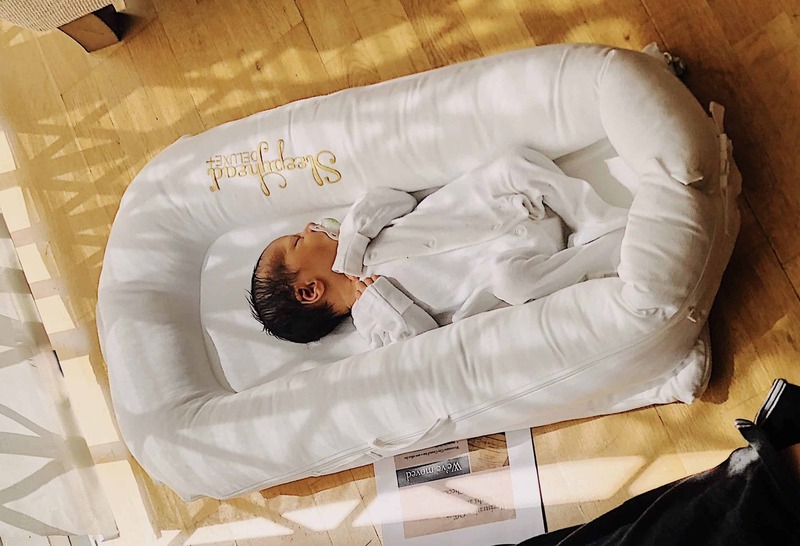 This meant me waking up super-duper early, running down to the local supermarket to grab a couple of breakfast items and then whipping up a great brunch for her with balloons, cards, flowers – the works! Now because she’s my mum, I naturally inherited some great traits of hers, such as her love for Chinese food and as you all remember, we went to Feng Shang Princess for her birthday last year. So this time round, I decided to burn a hole in someone’s credit card (not mine!) 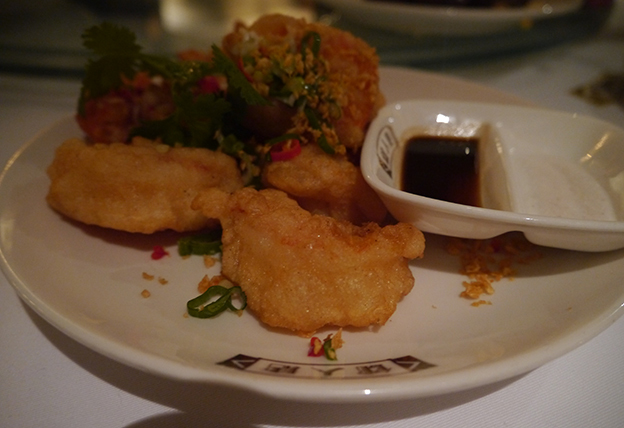 for the evening and booked a table at China Tang in the Dorchester Hotel. 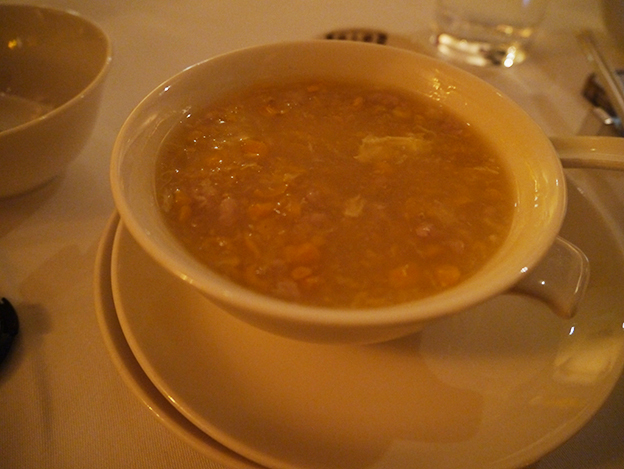 A classic and comforting staple dish at any Chinese restaurant, it was difficult for China Tang to go wrong with this soup. Crushed sweetcorn, chicken and egg shreds came served piping hot in a chicken broth and was the perfect option for the cold evening weather in London. 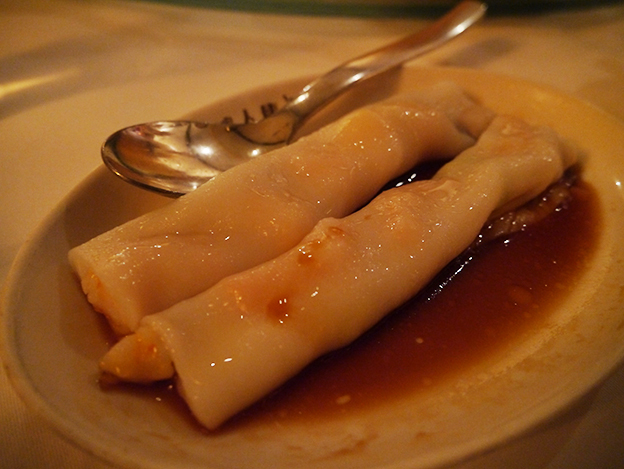 This prawn cannelloni is usually known as Cheung Fun and consists of prawns wrapped in rice noodles with sweet soy sauce drizzled on top. China Tang’s version was doughy with plenty of plump prawns wrapped inside and although it was good, it wasn’t as great as places like Royal China. These were little dumplings with either plump prawns or mixed vegetables and although I love dim sum, I wasn’t a fan of these; unless they were dipped in the chilli sauce so it had some flavour. 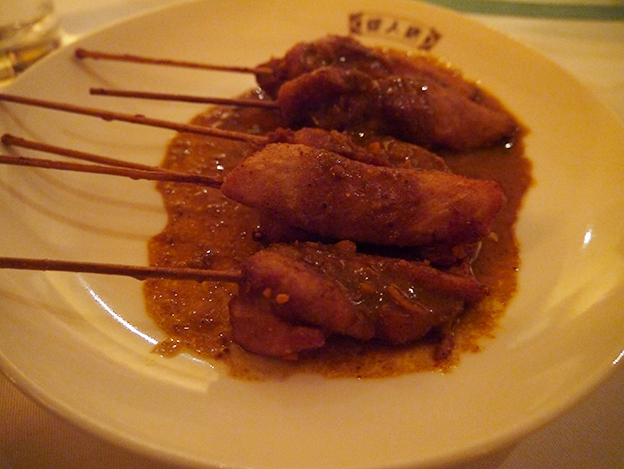 We opted for these two satays and were not disappointed. 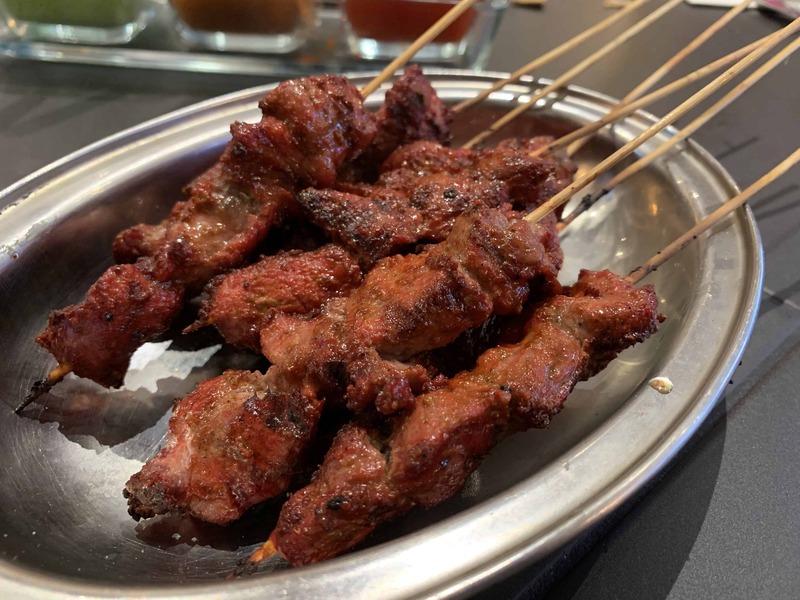 The meat, both the beef and chicken, was so soft and tender that it effortlessly came off the wooden stick, and tasted heavenly when dunked in the spicy peanut sauce. 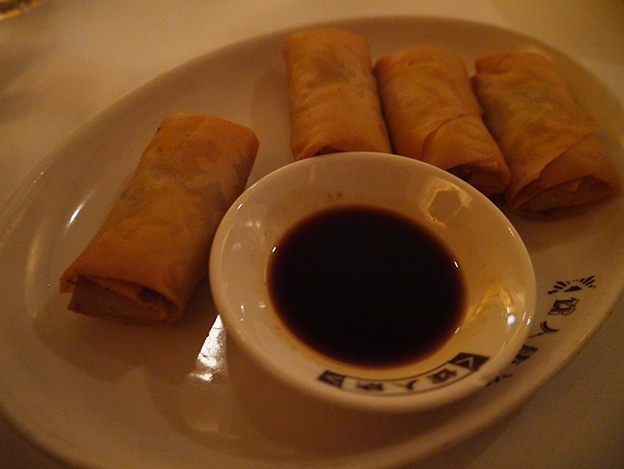 Tasty yet unremarkable crispy spring rolls with shreds of chicken inside. Now I know some of you must be a tiny bit grossed out about the fact that I had ordered pigeon, like my whole family were, but rest be assured, this tastes exactly like chicken. 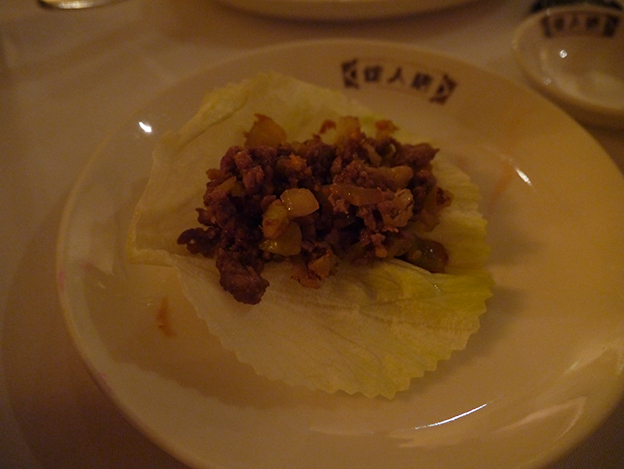 Pigeon mince, stir fried with vegetables, were wrapped in a lettuce leaf and topped with a dollop of plum sauce, and in all seriousness, it tasted great – so much so that we ended up fighting for the last leaf! For those who enjoy their spicy food, Szechuan is the way forward and this family loves their chilli. The dish consisted of sliced red chicken and little chillies generously camouflaged within. These chillies may look cute but oh no, these guys were dangerous, and if you happened to fall prey to one of these predators, you were in trouble. Unfortunately, Mum was the first man down followed by my two sisters. However, if you happened to avoid the chillies, the chicken was delicious and had a great kick to it. 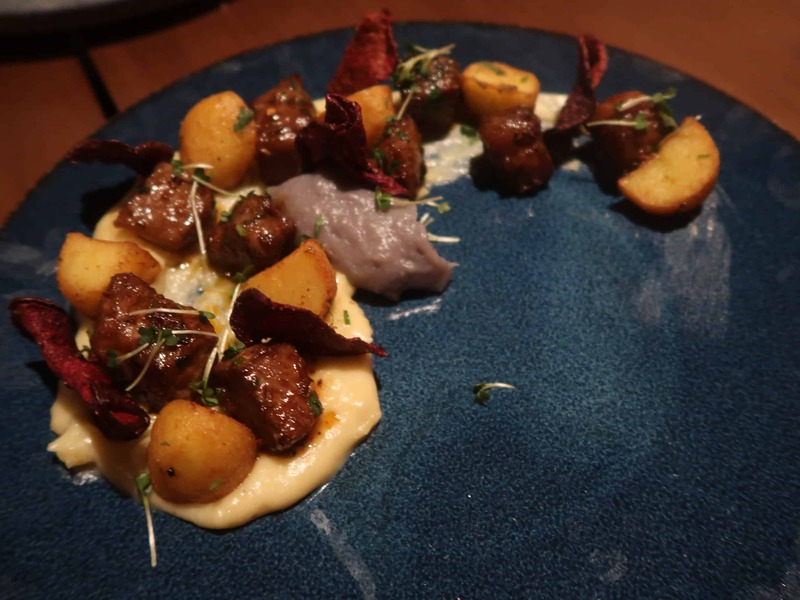 This dish won the approval of everyone on the table. 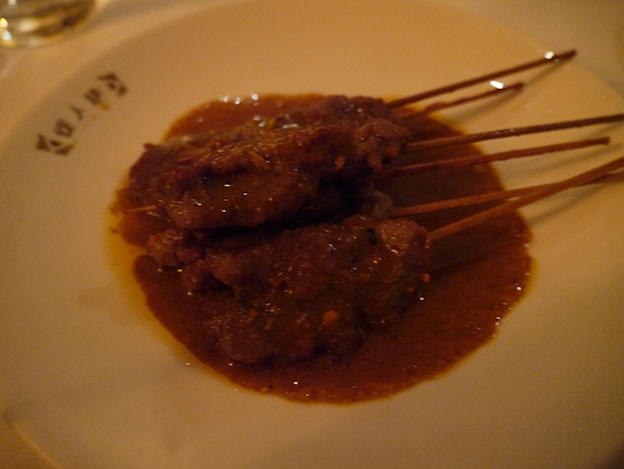 Cubes of tender beef were served in a dark, peppery sauce and instantly melted in your mouth. It may sound boring but this was another winning dish of the night. 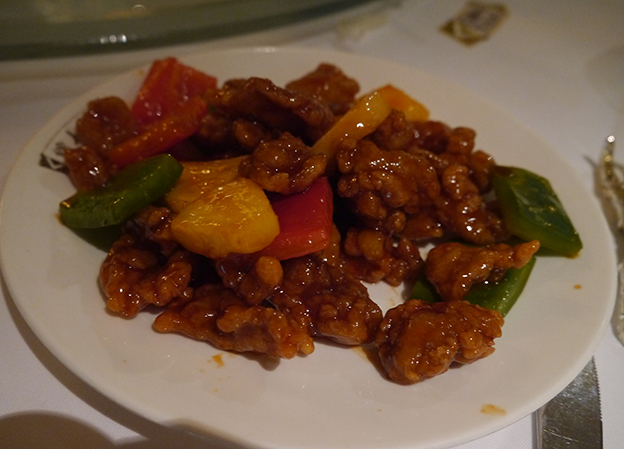 Crispy pieces of boneless chicken were doused in a delicious, sweet honey and slightly sour sauce, and was finished off so quickly, I only managed to eat two pieces! A fail safe option at a Chinese restaurant, the dish was good and contained huge, juicy prawns that were covered in a salty, crispy batter and topped with generous helpings of red and green chillies. This was a roast chicken, with the crispiest skin possible, which you could dunk into the Chinese salt or the lemon juice. It was okay – it had flavour but not enough and we ended up leaving half of it. 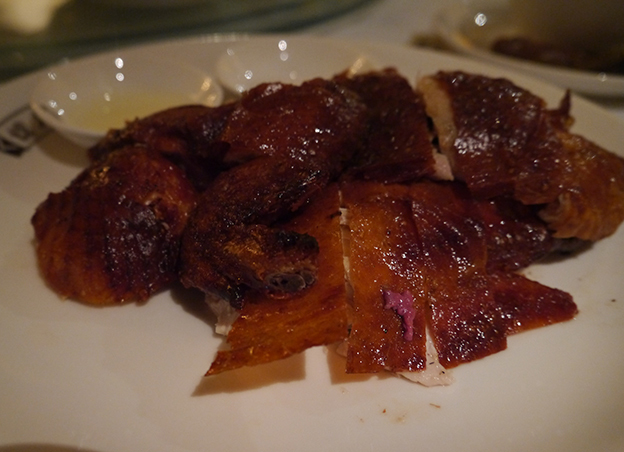 We instantly regretted not ordering the Peking duck which seemed to be the favourite dish of the restaurant! 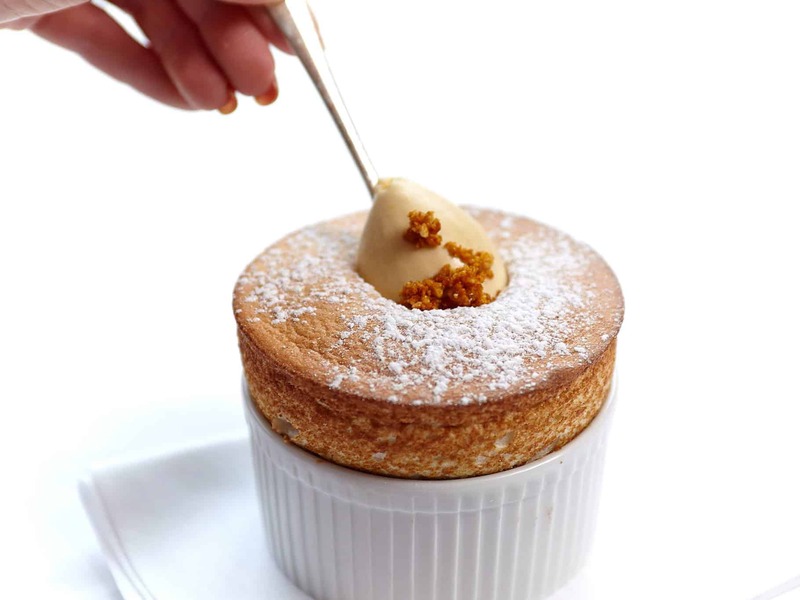 Apart from the delicious strawberry gateau we had ordered in from Patisserie Valerie, Brother B decided it would be best to order a dessert from the menu just to change it up a little. 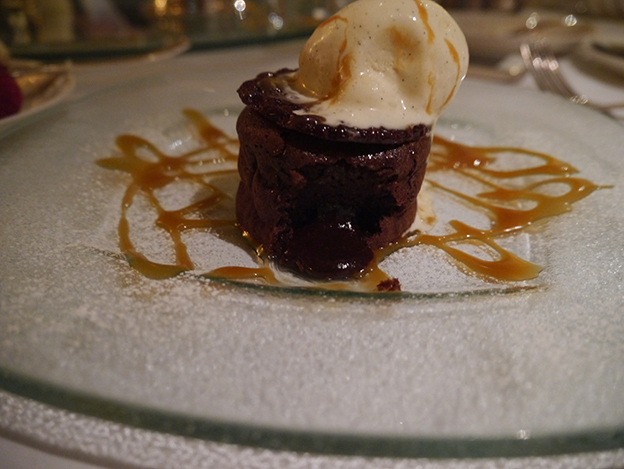 So he ordered the chocolate pudding and when it was placed in front of me, I was allowed to have the first bite under the consideration that I do not ruin it (which I did anyways). The cake was amazing. I can’t put any faults to it. 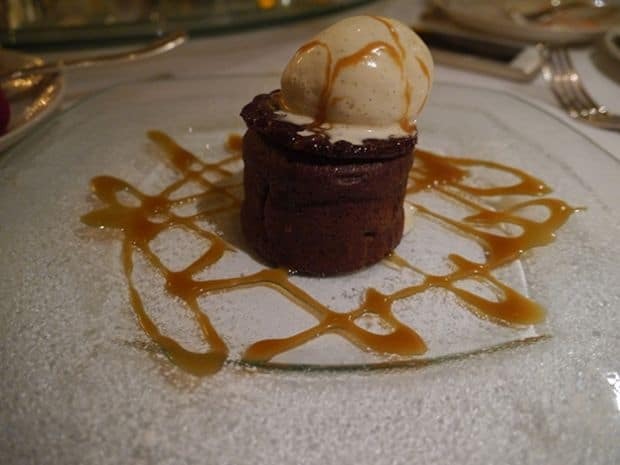 A sweet chocolate cake filled with oozing, liquid chocolate sauce, topped with a crispy chocolate honeycomb layer and a helping of sweet ice cream – absolutely delicious. Look at the chocolate flow! 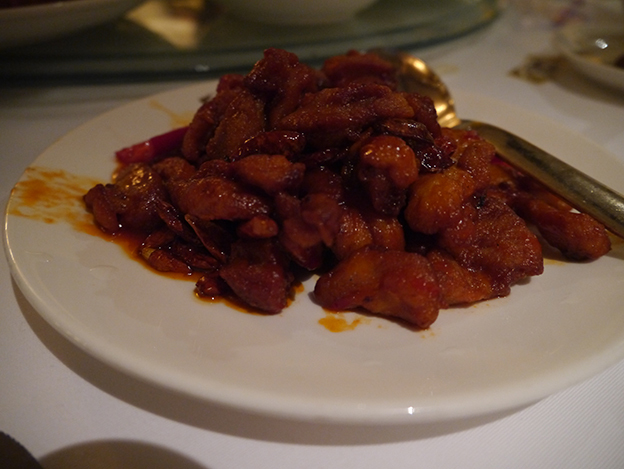 China Tang, despite being in one of London’s most prestigious areas, did not live up to the great expectations that I had had for the food. 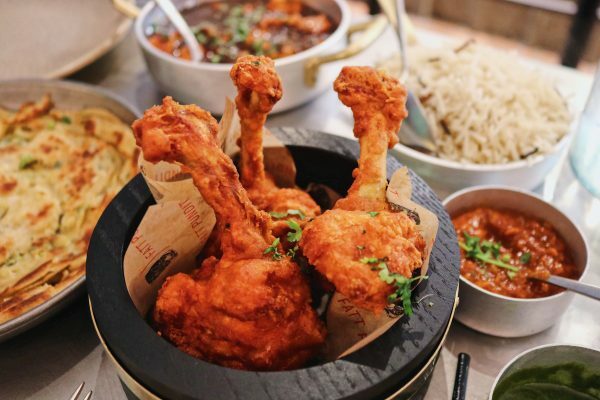 Yes, it was definitely one of the best halal Chinese I have had in London but it wasn’t as great as others I have had outside London. 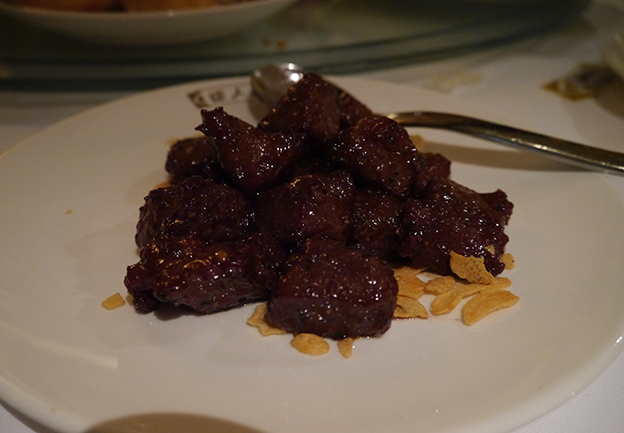 The starters were a real hit and miss, which shouldn’t be the case in any restaurant, but the main dishes (asides from the crispy chicken skin) were really good especially the beef in black pepper sauce and the sweet and sour chicken. 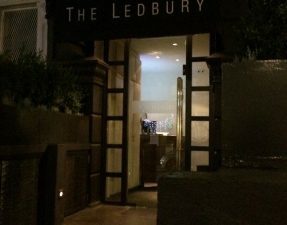 The total bill amounted to £417 between 8 of us, including service charge, so approximately £52 each, which wasn’t bad considering the venue was situated in one of London’s classiest hotels on Park Lane. For those of you who plan to go there, you must book in advance (a week minimum) especially if you are in a large group. 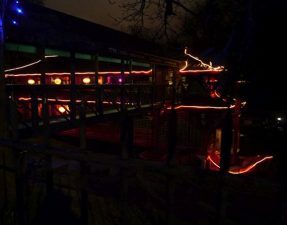 The restaurant was ridiculously busy with large groups of friends or families, and small tables of intimate dates, meaning the atmosphere was lively and fun. 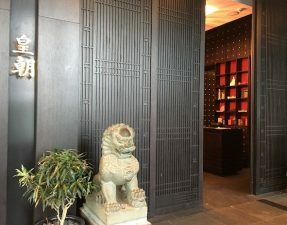 Even when we left late, the restaurant was still loud and buzzing with all the guests having a good time – China Tang is definitely a restaurant to revisit again; not just for the food but for the people watching! The service was attentive, considerate and helpful throughout the evening with just a handful of times where it was difficult to grab the attention of a waiter. They guided us as to what portions would be enough and even informed us when we had ordered too much instead of letting us spend and waste more. After singing a loud happy birthday to Mum with a delicious cake and showering her with presents, we left the restaurant feeling content and happy. Mum had had a great day surrounded by flowers, presents and food but what made her the happiest was that she got to spend the day with me! (Okay, and the other children and grandchildren she has too!). Halal status verified by the restaurant which has a separate halal menu. Please specify that you will require a halal menu once you are at the restaurant. 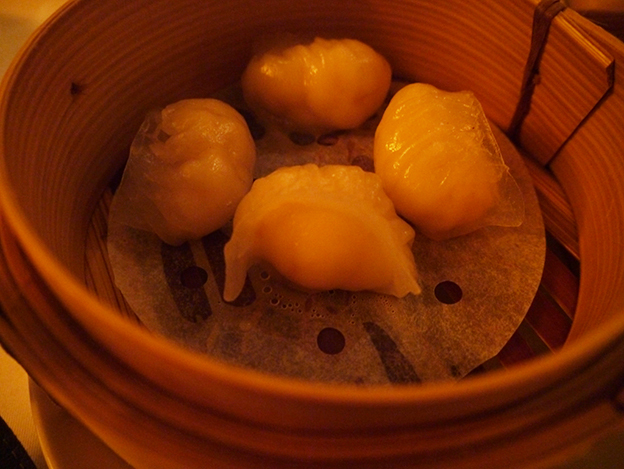 All the dim sum is halal and the dishes that consist of pork are stated. – Halal status on all meats verified by restaurant with certificates. They have a separate halal menu. I am very confused – you say that it wasn’t very good yet gave it 4 and 4.5 which are high ratings. I’ve been here before and believe it is overrated. Service is poor and food has no taste. Maybe I went on an off day. Hi there Halal Socrates – its been a while! i will be visiting later this month, could you advise on what the seating situation is like for couples? and also if there are ant items on the menu that are a must order?